Þóra Pétursdóttir, who spent the 2016/17 academic year at CAS, will use the grant to continue her work researching nature and cultural heritage. Þóra Pétursdóttir, a researcher in the Department of Archaeology, History, Religious Studies and Theology at the University of Tromsø - The Arctic University of Norway (UiT), speaks during her stay at CAS. 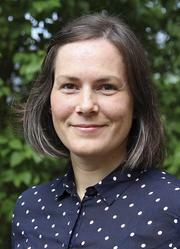 Þóra Pétursdóttir, a researcher in the Department of Archaeology, History, Religious Studies and Theology at the University of Tromsø - The Arctic University of Norway (UiT), is one of one recipients of this year's Tromsø Research Foundation (TFS) Starting Grant. Pétursdóttir spent the 2016/17 academic year at the Centre for Advanced Study (CAS) as a member of the project After Discourse: Things, Archaeology, and Heritage in the 21st Century. TFS, also known as Tromsø forskningsstiftelse, launched the Starting Grant Program in 2016. Open to researchers affiliated with UiT, the programme supports young researchers with long-term funding. Pétursdóttir will share the NOK 36 million pot with two other recipients. In a UiT press release, Pétursdóttir said she will use the grant to promote a critical discussion and dialogue about nature and cultural heritage.